New research suggests that much of the eruption activity near the south polar region of Saturn's moon Enceladus could be in the form of broad, curtain-like eruptions, rather than discrete jets. Curtains of vapor and ice miles high and hundreds of miles long might erupt from rifts on Saturn's icy, ocean-harboring moon Enceladus, researchers say. In fact, most of the seemingly discrete geysers seen on Enceladus until now may have just been optical illusions of these much broader "curtain" eruptions, the scientists said in the new study. Scientists then determined that these outbursts originate from four "tiger stripes" — fractures on Enceladus' south pole named after the cities Alexandria, Baghdad, Cairo and Damascus. These explosions are fed by a network of cracks that may carry water up from a giant subsurface ocean. Initially, planetary scientist Joseph Spitale, of the Planetary Science Institute in Tucson, Arizona, and his colleagues thought these eruptions were concentrated jets. But now, they've found that these explosions may actually be giant curtains of vapor and ice. "A lot of things that looked like jets were optical illusions — they were really curtains," Spitale told Space.com. 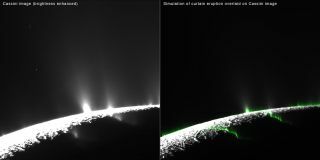 The scientists analyzed Cassini images of what they thought were jets from Enceladus in order to determine where these eruptions come from and what might cause them. "What became evident very quickly was that a lot of the tiny little jets we looked at were real slippery — we couldn't triangulate them," Spitale said. "We also saw really broad areas of emissions that couldn't be jets — they were just huge fuzz." So, how could the "curtains" be mistaken for focused jets? The fractures from which the curtains emerge often meander, Spitale said. This means that, instead of stretching in perfectly straight lines, the curtains can fold against one another. In places where these curtains bunch up, the eruptions of vapor and ice are denser, and can resemble jets, Spitale explained. "This should have been obvious, but it was a big surprise to us," Spitale said. In five snapshots of Enceladus taken during a one-year period across 2009 and 2010, "it looks like most of the time, most of the fractures are turned on," Spitale said. "They're emitting at some level all the time." Spitale noted that Enceladus may still have concentrated jets of vapor and ice. "We're not saying that all of these eruptions are curtains," Spitale said. Jets might occur where fractures meet, or where debris falling into fractures has propped the cracks open, he suggested. Future research can see when these curtain eruptions grow or shrink in strength. "We think tidal forces are influencing these eruptions — the gravitational pull of Saturn should be affecting the amount of stress on these fractures to open or close them," Spitale said. The new study was published online today (May 6) in the journal Nature.